Since the songs from OKLAHOMA! provided more hits than any previous musical, the capturing of so many three minute gems in one set of four discs was exciting indeed. When the 33 1/3 rpm LP came into existence, an uninterrupted twenty five minutes of music per side was possible. And when engineers at the CBS laboratories invented this new technology they were lucky to have as their president a man who instinctively knew what to do with it. Goddard Lieberson realized that an "Original Cast Album" could tell the story of the show as well as simply being a collection of songs. With SOUTH PACIFIC, his first Rodgers & Hammerstein album, he created a musical ending for the album which was different from the ending of the show. Why? To give the listener a feeling of completion to the story. The last new song in SOUTH PACIFIC is "This Nearly Was Mine," and to end the album there would leave the story up in the air. Lieberson took a reprise from the first act and created an aural equivalent to what happened on stage. It was a stroke of genius. But Lieberson's pioneer spirit didn't gather imitators quickly enough - the Original Cast albums of the subsequent Rodgers & Hammerstein shows remained collections of songs until Lieberson took charge once again with CINDERELLA and FLOWER DRUM SONG. In the early 80s, with the advent of the sixty-plus minutes of uninterrupted music available on CD's, even more possibilities emerged. Lieberson was by then gone and some of his followers felt the cast album could be brought to a new level of artistry by including dialogue to help give the listener a better sense of the show. This works wonderfully well in through-composed shows and those of Stephen Sondheim where sung and spoken words are often intermingled. But with musicals in the song-scene-song tradition, dialogue can be intrusive. Of course, you can program the dialogue portions out on your CD player, but who pays that kind of attention? I push "play" and sit back. On the plus side, however, the extra time available on CD's means that dance and incidental music that had often fallen victim to the clock could be included with the rest of the score. So with today's range of technological possibilities the challenge is to determine what will work best in each circumstance. Discussions for the albums of LOUISIANA PURCHASE, STATE FAIR and THE KING AND I all began with the same question: What to record? THE KING AND I is a hit Broadway production but the show has often been recorded. What was there to add? The producer, Bruce Kimmel, had clear notions of including enough dialogue to establish the important story moments and all new dance music, yet leaving out the fifteen minutes of music that accompanies the famous "Small House of Uncle Thomas" ballet. His album captures the current cast at its very best, includes moments that have never been recorded before as well music unique to this production, and gives the listener a good sense of the story. As one reviewer said, when the album begins and all but the first few chords of the overture are gone you know right off that this recording will be different. It has even been called "near-definitive" - which is high praise under any circumstance! With LOUISIANA PURCHASE and STATE FAIR, decisions were fueled by the fact that neither show had ever been recorded. LOUISIANA PURCHASE didn't run long enough originally and hadn't been revived enough to establish itself as a classic. And it was overlooked in the era of studio recreated shows (once again - a Lieberson creation.) So it really was a discovery to us all. STATE FAIR was a new show pulled together largely from existing elements. Although based on the 1945 film, the stage version is a new creation with entirely new orchestrations and includes songs that had never been heard before. Both shows clearly needed recordings if they were to have future lives. On both albums (produced by Hugh Fordin for his nicely eclectic label DRG) we decided to utilize many of the available minutes with dance music. Since we felt many listeners would be getting their introduction to these shows through the albums, we wanted to provide a sense of what the dances were and where they belonged. LOUISIANA PURCHASE had only been performed for six concert performances so a lot of decisions had to be made as the album was being recorded and edited. STATE FAIR was running on Broadway so it was easy to run down to the Music Box Theater and listen to the show repeatedly. We decided not to record any of the tap dancing since they can get awfully tedious after a couple of hearings. For both recordings, dialogue was used only when absolutely necessary: on LOUISIANA PURCHASE, to set up characters like Madame Bordelaise whose wisdom and warmth needed to be established before she began to sing. On STATE FAIR, where we needed to bookend the story, dialogue was rearranged in the "Our State Fair" opening to set up the neighbor's bet about whether the family would have a good time at the fair. After much spirited discussion it was decided not to include dialogue in the finale, but to let the music tell whether the bet was won! We are proud of these three albums. 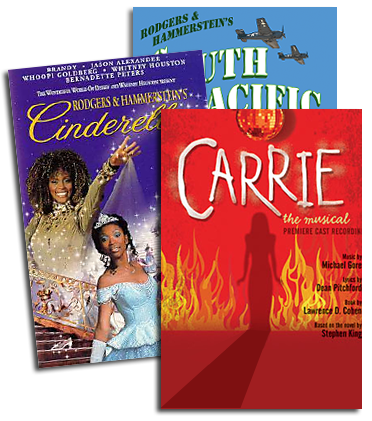 Cast albums, whether we like it or not, stand as permanent documents. Are there things that could be made better? Always. But if the legacy of Lieberson, both in his choice of material and confident performances captured on disc, can be continued, we will do what we can to carry on the tradition. Musical theater wouldn't be the same without cast albums. And what will next years' albums be? I have no idea - which is part of the fun.